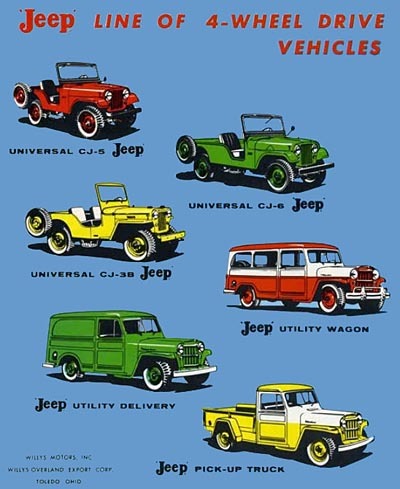 See also a page from an Export Corp. catalogue (120K JPEG) of "The World's Most Useful Vehicles," with a more accurate illustration. 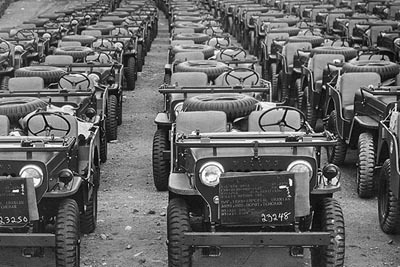 Many Jeeps were crated for export as CKD ("complete, knocked down"), to be assembled at their destination, or as SKD ("semi, knocked down") to allow the addition of some local parts during assembly. 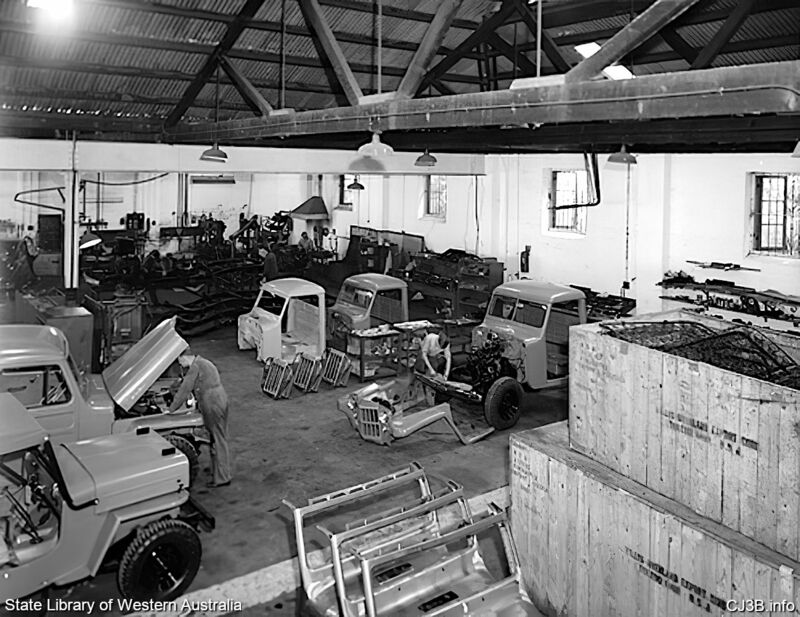 This photo courtesy of the State Library of Western Australia shows assembly of Jeep trucks and a CJ-3B, at M.S. Brooking Pty. 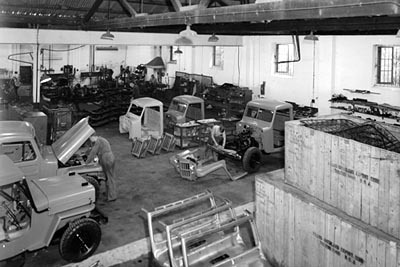 Ltd., a vehicle importer and dealership in Perth, Western Australia. 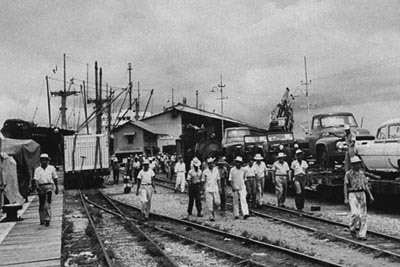 The photo was taken on on 29 March 1957, and preserved by the Historical Records Rescue Consortium (HRRC) Project. 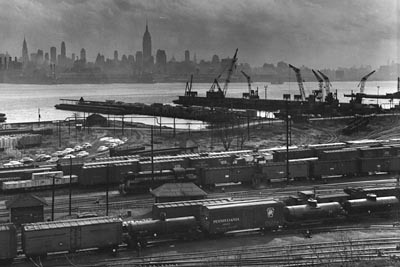 A closer look at the New Jersey pier in the above photo reveals one of many shipments stranded by the strike -- Jeeps sitting on a Rock Island flatcar. 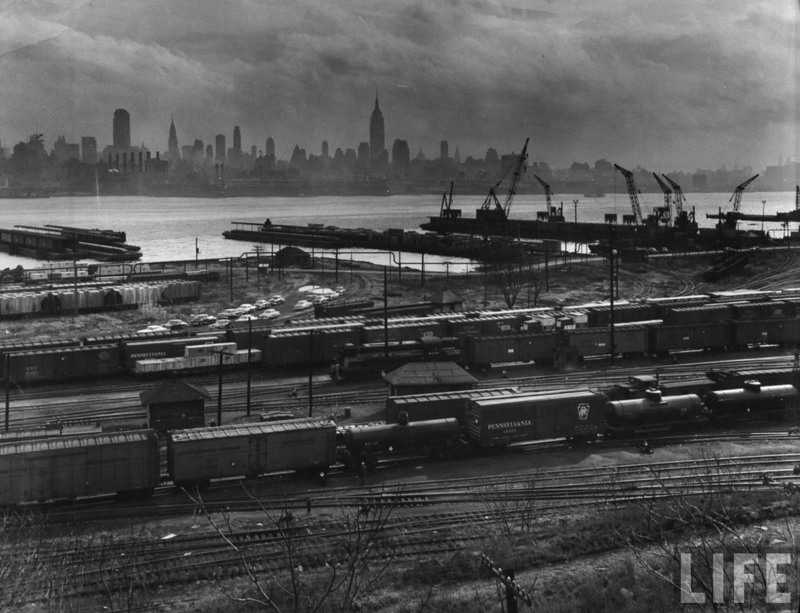 These photos are from the LIFE Magazine Photo Archive. 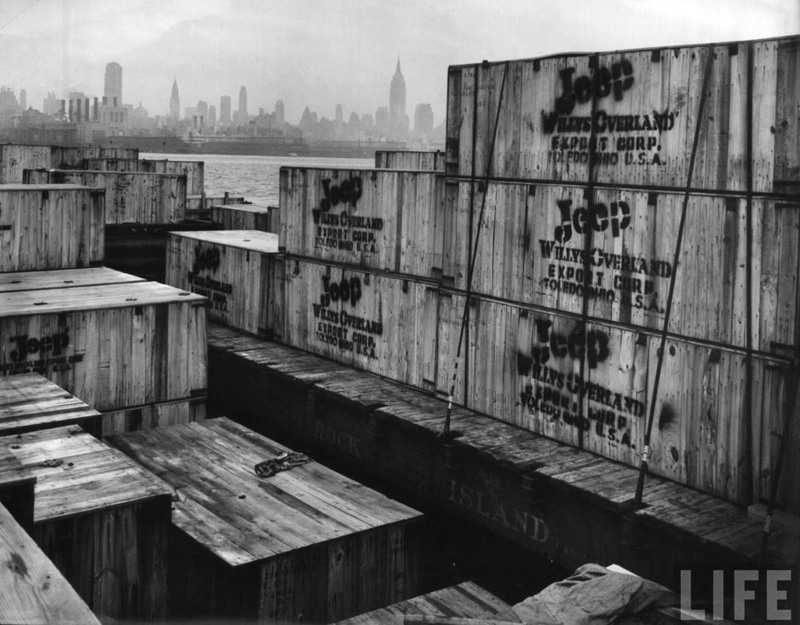 Jeeps shipped fully assembled from Toledo were apparently not crated (see CJ-3Bs at the Port of Toledo.) This 1962 photo taken by the Toledo Blade shows a dockload of M606s (CJ-3Bs with military accessories) heading for Iran. Anybody know what parts would be in the box in front of the grille? According to The Blade the photo was actually taken at Presque Isle, Michigan, on 22 November 1962. 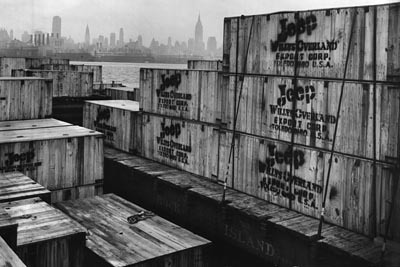 Shipments of M606s exported for military aid under the Mutual Defense Assistance Program accounted for a substantial percentage of the limited CJ-3B production in the 1960s. 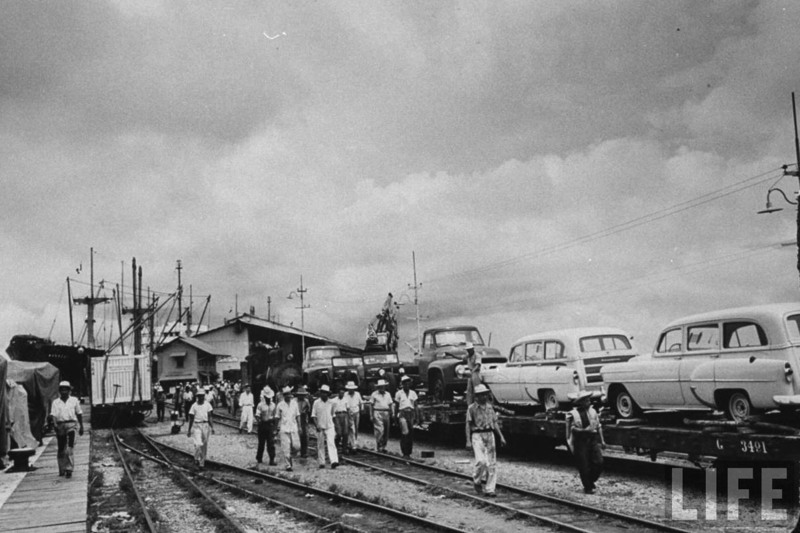 The other end of the line: another shot from the LIFE Archive shows a couple of CJ-3Bs, along with some Ford trucks and station wagons, loaded onto rail cars at a dock in Guatemala in 1953. The workers here are not headed out on strike, but headed for their lunch break. Photo by Cornell Capa. A lineup of CJ-3Bs delivered to their new workplace, and I'm guessing it's in Puerto Rico. Does anybody recognize the location? 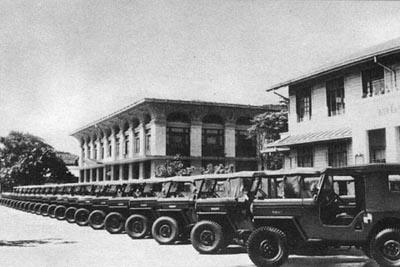 The photo was published in the Willys promotional booklet Jeep Vehicles in Public Service, as an example of Jeeps being used in public health work. 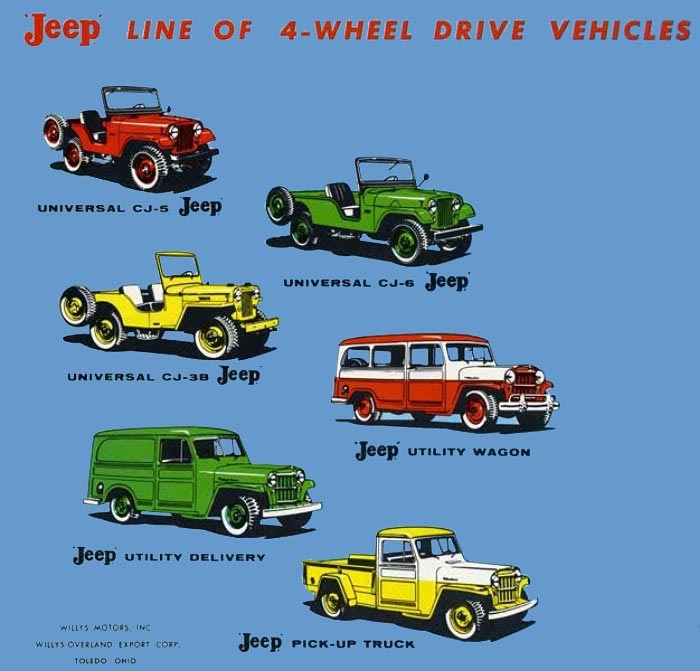 I'm also guessing that after the first six or so Jeeps in the lineup, the rest are the product of one of Willys' busy photo-retouchers. 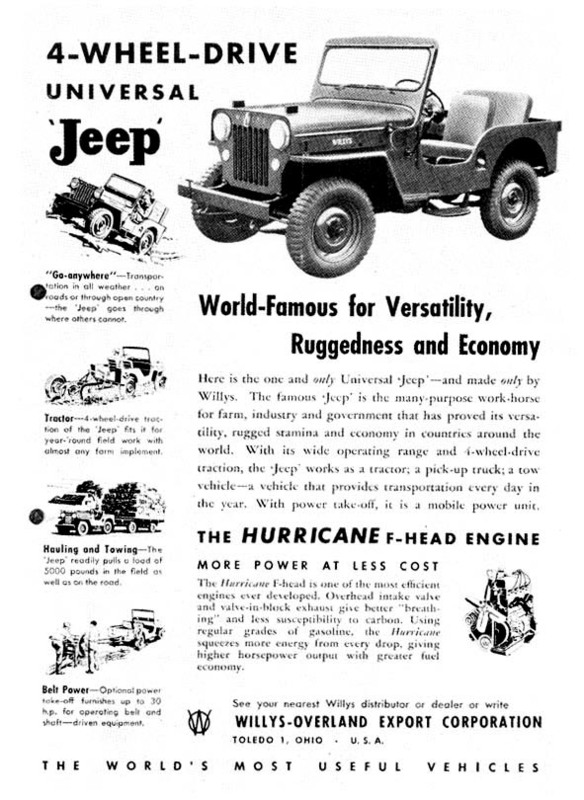 See Willys-Overland Export Corporation's 1953 brochure for the CJ-3B, The World's Standard Utility Vehicle. See also more photos of CJ-3Bs at the Port of Toledo. 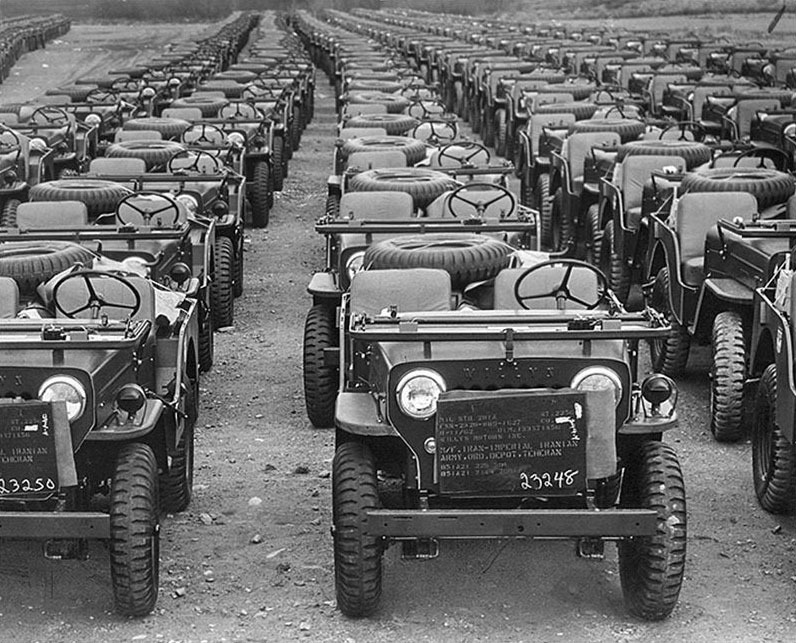 Return to CJ-3Bs in History or to Building Jeeps at The Parkway Plant on CJ3B.info.